A great family-friendly trail with gently rolling hills and great views. 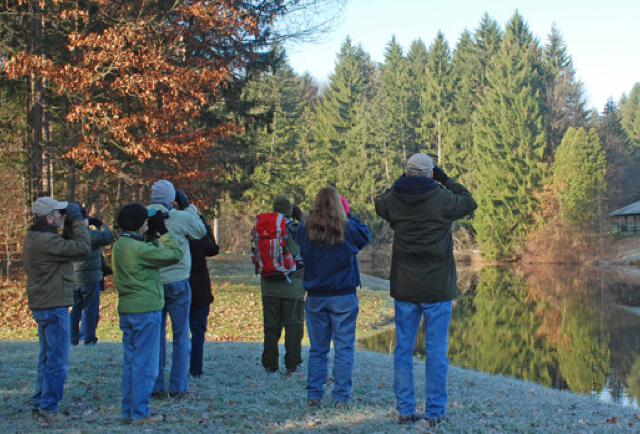 At nearly 3 miles in length, the Tree Farm Trail represents one of the CVNP’s easier hikes and includes the picturesque Horseshoe Pond—home to a fair amount of non-deciduous greenery, namely pine and spruce. The space earned its nickname from a former iteration as an evergreen tree farm. In the winter, this trail rocks. You’ll need an hour-plus to do the ski-trail justice (you can be aerobic about it, but we’re betting on a couple stops along the way just to soak up the view). Visit once, and you’re likely to want to beat the locals out of bed to get there as early as possible. Great sunrises here. From Peninsula, take Riverview Rd. south. Turn right on Major Road, then watch for parking at the Horseshoe Pond Parking Lot on Major Rd. A smooth, wide loop, Tree Farm Trail serves as home to a whole host of woodland creatures (rabbits, squirrels, moles, chipmunks and the occasional deer). It’s a bit like “Bambi” come to life and families in particular are bound to enjoy everything about it. Hikes and trail runs are good here. It has everything great about the CVNP in one place: a beautiful pond (where anglers can be spotted occasionally tossing in a line) with a beautiful loop that doesn’t push visitors to their limits… unless they choose to push themselves with a pair of running shoes. This is one of the most mainstream locations in the park system, since it’s a real people-pleaser: Hikers, trail runners, cross-country skiers, birders, photographers, and especially kids and families will love this trail. It’s hard to think of anyone who wouldn’t like it, unless you’re the type who is geared up for a more intense challenge. If that’s you, this might be a pass… but we think that when you get out of the car (or off your bike) you’re going to take a look around and want to explore anyway.